There are far too many to write all of our climbing experiences, but here are a few highlights. Psyched!? In Grands Montets, before starting our approach. A guidebook titled Mont Blanc Supercracks came out fairly recently (2012), which compiles a collection of the best crack routes in the area. When I spotted it in my last visit to a bookstore in Chamonix, I bought it before I realised, even though most of routes in the guidebook are beyond my current grade. 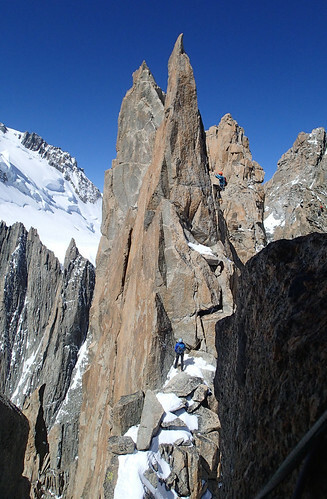 One of the routes that interested me in the guide is Versant Satanique in Le Minaret, at the foot of Aiguille d'Argentière, the meat of which is a superb hand to fist crack, and it is one of Batoux classics, too. I listed it as one of our potential routes in our rough planning with Rob. As our trip approaches, Rob suggested it as our acclimatisation route. 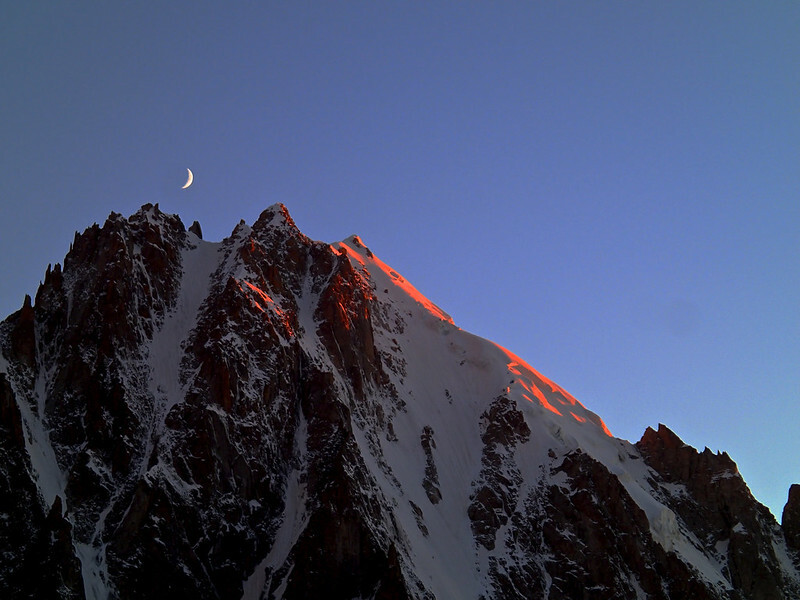 The summit of Le Minaret is only 3450m, and so the route is good for that, particularly if combining with other routes, staying for a few days, which we did. Simon, who leads up to F6b/+, said, Warming up at F6c? Well, great…… . To be honest, I wasn't sure, either. First, whereas I like crack routes, that does not mean I am good at them, and have had a hard time in many of them. Second, I have done no climbing practically for 6 weeks prior to the trip, as the life got in the way (Brexit didn't help), so I expected myself to be unfit on rock. Having said that, it is a crack route and so falls would be safe, and worst comes worst, we could aid up. If it is my dream route, why don't I dive in, biting a bullet, and get on with it? Our stay would be only for 2 weeks, and our primary aim is to go high, then if we miss this chance, we will be unlikely to have another chance, as it is not a day-trip route. Besides, Rob sounded confident; it is a good thing to have a reliable partner! So, went up we. We felt the altitude, but our psyche was high, too. Rob lead the first 2 pitches, and did Simon the next 2, before the crux 3 pitches. I felt P2 (only F6a+) was committing and nails in seconding, and that didn't boost my confidence. It turned out Rob expected me to lead those crux pitches…. Good to have a relying partner?! Which of P4 and P5 is harder depends on the guidebooks. It turned out P4 wasn't a path by any means with an awkward off-width at the top, but I did OK despite the altitude, and my confidence level went up. However, P5 was a different story. I fell off at the crux a couple of times, which was found to be British tech 6a. And the route above was also pretty sustained and hard (many 5c-s). I was surprised I managed the rest clean. At the same time, I was disappointed as I guessed I could have done the pitch clean, had I kept climbing the last 6 weeks. Then I told myself I should be glad I managed it in the end despite the break. Rob and Simon testified the pitch was indeed hard, Simon properly aiding up in 2 sections. And I lead on — the last pitch P6. I had two Friend No.4s, and placed both in the lower section, before I desperately needed one the upper off-width section. I have heard Friend No.4s would be handy in this route, and they had been so to some extent, yet not essential up to this point. That is why I had placed them in non-critical but place-able points early in P6. I didn't know they were crucial later…. After a nerve-wrecking runout, I managed to top out to my great relief. Who said/thought a crack route would be safe? 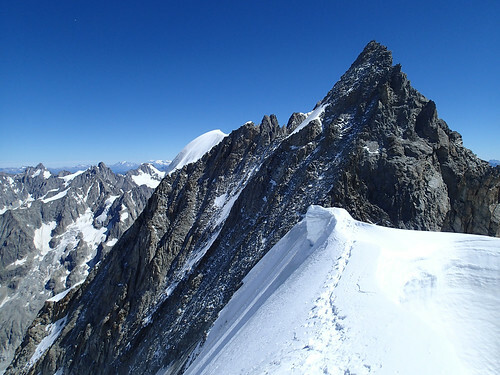 I have once eyed up for the majestic Diable Traverse, which is an airy ridge traverse at the altitude of 4000m, negotiating peaky pinnacles, and finishing directly at Mont Blanc du Tacul. It didn't happen that summer, but this time the conditions were looking good. 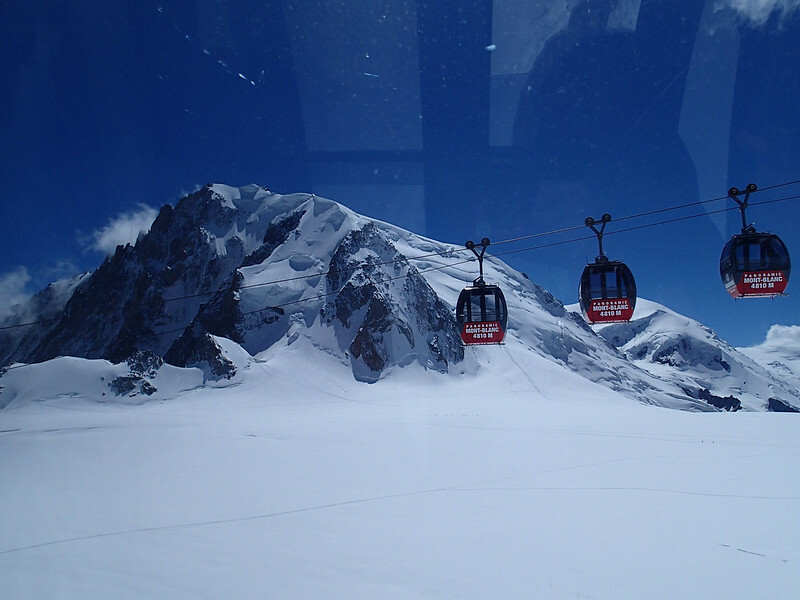 Helbronner Panoramic Line with the background of Mont Blanc du Tacul. We carried plenty of foods in plastic and paper bags to the hut in our hands for 3 nights — a luxury! After 2 am start from the hut, I was cursing my lack of fitness, struggling to keep up with the pace set by Simon and Rob. But when I realised we had done the approach with the guidebook time of 2-hours in an hour, I didn't feel too bad. Good pace! We had been decently acclimatised by that time, having bagged 3 near or above 4000m peaks and stayed in Torino hut for 3 nights in a row. 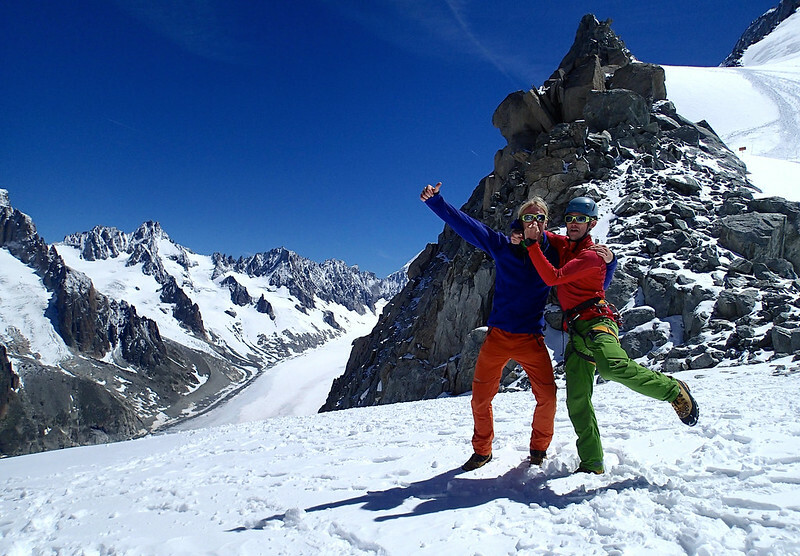 Party ahead on Diable Arete. What we hadn't realised was we were taking a wrong approach gully to get to the ridge proper (we should have confirmed carefully with the guide before we had committed…). We ended up negotiating an unknown terrain, and took 4 hours, as opposed to 1.5-2 hours, before finally popping up to the ridge. The point we reached was after the first pinnacle, and by that time a couple of parties, who hadn't been even within our sight before our entering the gully, were ahead of us. No time wasted to indulge ourselves with disappointment, carried on we. Rob and I lead alternatively with a single 70m rope. Climbing wasn't easy with big boots, though we had no choice. We progressed, pulling on gear at times. On the third pinnacle, I took the last pitch. It was fairly steep with bulges. In the upper part, I placed the largest cam I had in a crack and tackled the bulge above. One more move and I would be in relative safety, but I could not find a decent hand hold, nor an obvious gear, feeling the strength of my arms waning. I took a fall. Because of lack of stamina, on a VDiff terrain…. That is climbing at altitude. I thought I had known what it would be, but apparently I didn't. I finally realised it. Though the last gear was just below my feet, I fell for a fair distance due to a rope stretch and hurt my right ankle. Judging it would be not serious, I got back on it. It took another two attempts just to place a desperate small cam in a higher horizontal seam (Rob failed to retrieve it in seconding, as it was too over-cammed). I took a good rest on it, and at last finished the pitch. Was the pitch really that difficult? No. Simon and Rob later seconded the pitch separately, instead of simul-seconding, as they expected the pitch would be hard after seeing my fall. Simon was pleasantly surprised how easy the route actually was. In alpine climbing like that, one should never fall. Lesson should be learnt. Now Rob took on leading from there, as I was weak and frightened. After climbing up and down the next one, we decided to bypass the last pinnacle (L'Isolée), which is the crux of this route if taken direct, and went to the summit, welcomed by a gorgeous view. We are shattered after the big day…. My ankle was beginning to hurt considerably by that time, though. A few tablets of pain killers managed to take me back to Midi in time for the last lift down. Considering I was badly limping for the following 2 days, and that my right ankle is still far more vulnerable than my left at the time of this writing, 1 month after the incident, I should celebrate either my endurance or modern pain killers? Mont Blanc and Mont Maudit, shot from Mont Blanc du Tacul East Summit. Ominous looking Aiguille de Blaitière. After 2 days complete rest (for me) due to the twisted right ankle, and a day of easy cragging, we went for it. Since the weather forecast was dodgy with a risk of afternoon thunder, we did not expect to finish the entire route, but would be content with Fissure Brown (P2) and maybe a couple of pitches above. I took on the challenge of Fissure Brown, armed with a Friend No.4 and 5, which Brown and Whillans would not have dreamed to have. Nevertheless, what is said was, I found unsurprisingly, very true. Desperate! In fact many parts of the crack were too wide even for No.5, and I felt a runout, after using both the cams in a crack fairly low down. I ended up using a wooden wedge in the crack as a hold, and then a few metres above, grabbing a quickdraw to clip a rope — I had already clipped the quickdraw to the in-situ peg, and so by definition I could have far more easily clipped the rope to the krab, but I was too scared for a potential fall. After spending ages, sweating a lot, I finally completed the pitch. Rob and Simon then enjoyed(?) seconding it. 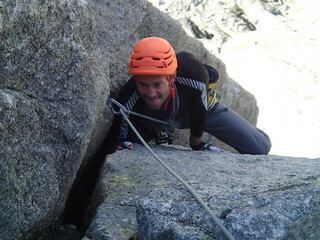 Interestingly, Rob thought it had been easier than the crux pitch of Versant Satanique. I felt completely the opposite. I don't know if it was the difference between (terrifying) leading and seconding, or he may be possibly better at off-width, or perhaps most likely, I am just rubbish at off-width! Whatever, I felt exhilarated as a Britain-bred climber, having climbed this historic route, even though it wasn't a clean ascent! 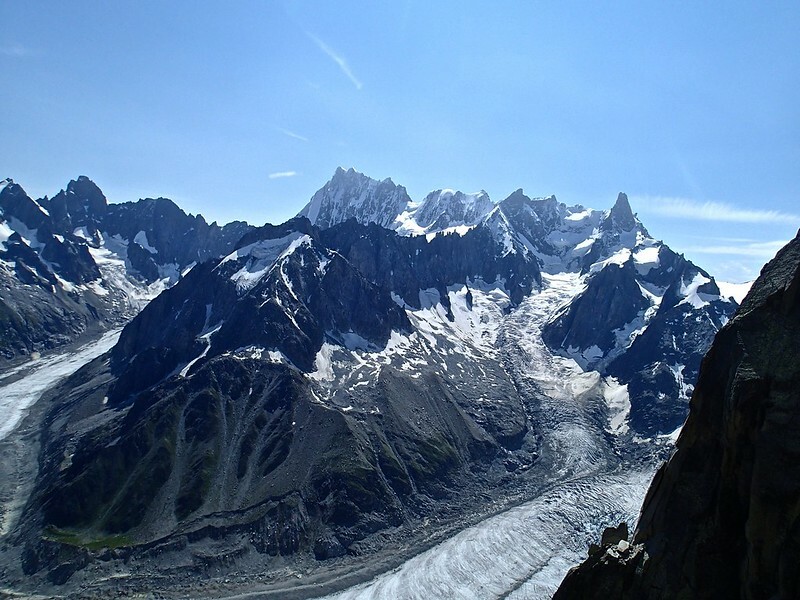 If there was one mountain I wanted to climb in the area since my first visit to Chamonix, it would be Grandes Jorasses. It is so beautiful and majestic. It is the mountain that tourists, as much as climbers, would admire the most from the ever so popular Midi station or Montenvers, when their eyes are not fixated to the most-well-known gently-shaped Mont Blanc, even though a half or more of them probably can't identify its name. I am not an exception. 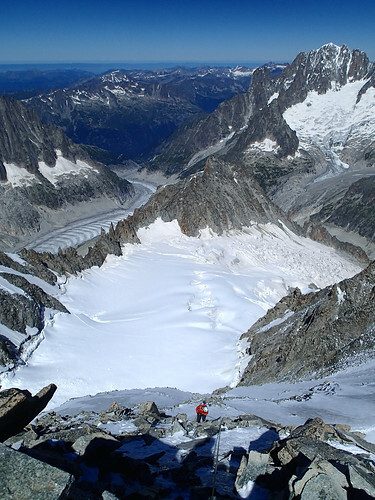 In my first trip to Chamonix, I scaled Mer de Glace, a branch of the glacier which leads to the north side of Grandes Jorasses, and realised how remote it is. The North Face is one of the great three in the entire Alps, along with Matterhorn and Eiger, for a good reason. In short, there is no easy route from the north (French) side. There are some from the south (Italian) side, though the easy routes are still long and arduous, and worse, chossy (risky). 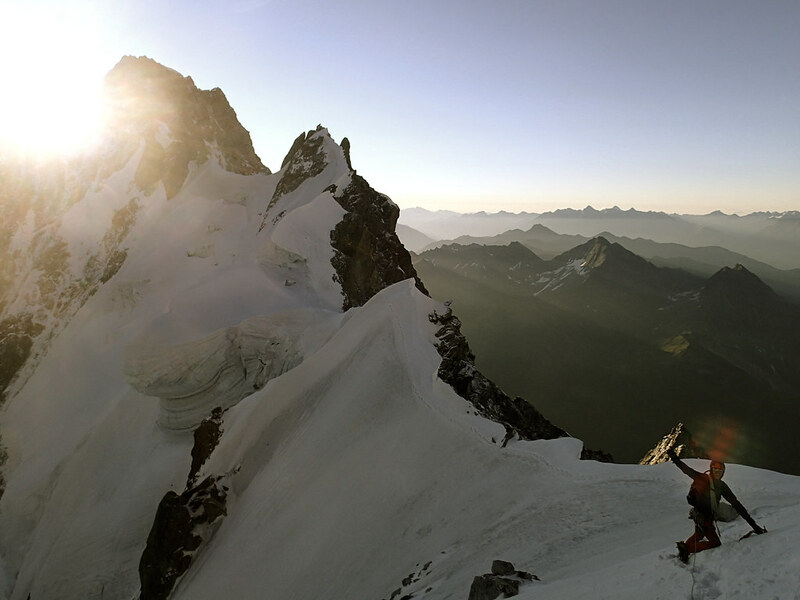 In short, if you want to scale and enjoy Grandes Jorasses, you had better get on hard or hard-ish routes. Soaring Grandes Jorasses massif. (top) Shot from Col du Midi (2010), where we passed in our approach (not in dawn as this photo but in morning day-light) to the foot of Dent du Géant (the highest-looking prominent peak in the photo) to start our traverse. (bottom) Shot from Grépon - Mer de Glace (2010). 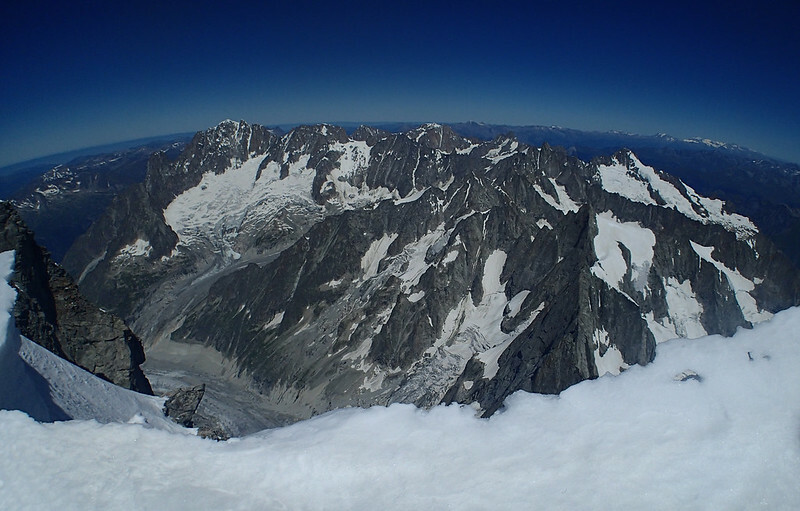 The traverse starts from the foot of Dent du Géant, the sharp peak near the right-hand end, and culminates at the highest point, Pointe Walker (4208m), in the centre of the photo, and descends to the Italian side, back of the photo. 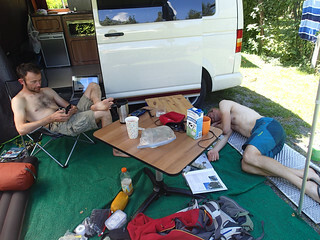 After Rob and Simon had left, seeing the good weather maintained, I decided to extend my stay in Chamonix, hooking up with a new friend, young and keen Rich, who lives local. Rich first suggested Walker Spur in Grandes Jorasses, arguably the most famous classic alpine north-face route in the Chamonix area. Fantastic as it sounded, I did some research, consulting at the guide office and scouting the route from Montenvers, and concluded it would not be in the best conditions. 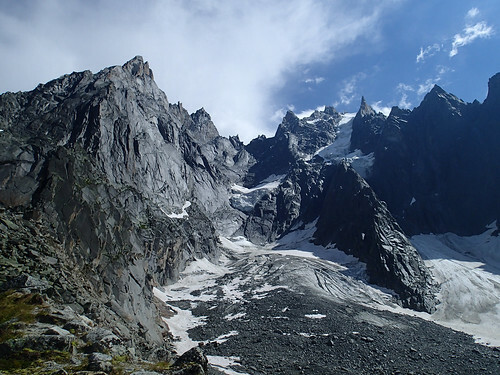 Although Walker Spur has been climbed in winter, so may be possible in any conditions, most parties choose to climb it in summer condition, where it is far easier. That is, to climb it (mostly) as a rock route. The route catches little sun, particularly before mid-July and after mid-August. Therefore, the best conditions are found only during the short period, and only after an extended dry spell. Our scheduled window was on 22-23 August, and so was a little too late, as told in the guide office. In fact, as it turned out, two parties of my friends successfully climbed Walker Spur on 23-24th and 26-27th. The first party had known the risk (of it being in not conditions), but went for it anyway, and got it as the first party during the period (after a preceding wet spell). I congratulate their courage and skill! I must come back another year! 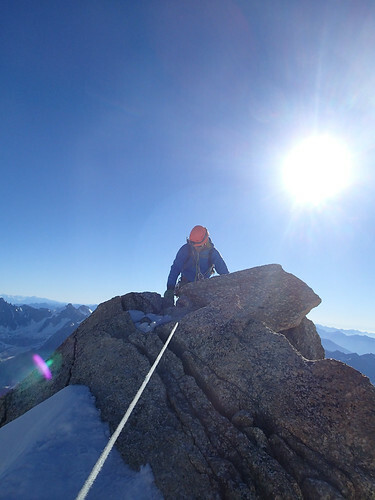 Instead, we decided to go for Traverse of Grandes Jorasses. The plan was 2-day ascent of starting from the Midi cable-car station, climbing Arêtes de Rochefort, and Dôme de Rochefort to Canzio Bivouac (hut), and then the second day, getting on the traverse of the main ridge of Grandes Jorasses (west to east) to the highest Pointe Walker, before descending via the normal route to the Italian side. 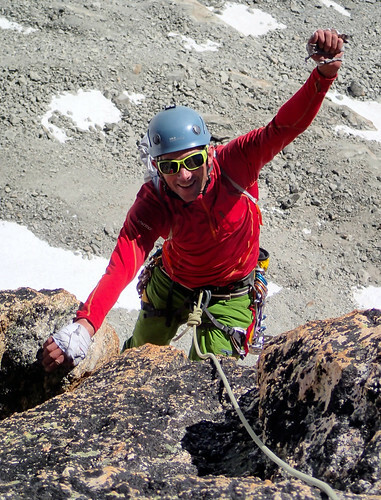 The ridge traverse is graded as Difficile (Commitment IV, Rock grades up to F5a, 14-18 hrs), and the descent should not be underestimated, either — long (6-7 hours), committing, tricky in navigation, involving many abseils. Not bad for a challenge to take on! In the morning of the day, the weather was in our favour, as the forecast had predicted. And off we left the Midi station, taking the first lift. 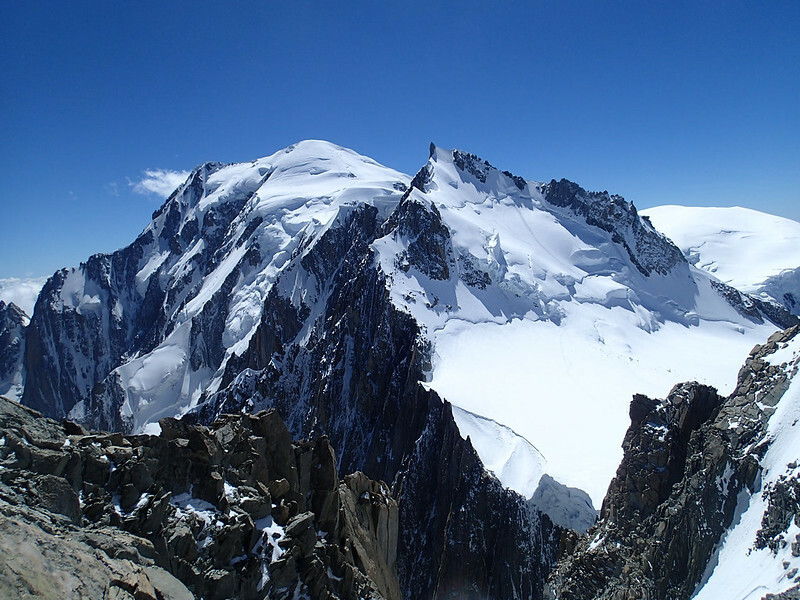 In fact I had done Arêtes de Rochefort up to Aiguille de Rochefort summit 11 days before, with Rob and Simon, and so was familiar with the first part. Richard being so fit and well acclimatised, it was often a struggle for me to keep up. However, speedy progress was more than welcome in alpine climbing, and so I had no complaint. Crammed Bivacco Canzio — 11 climbers stayed overnight for 8 spaces. Knife ridge of Grandes Jorasses traverse. After climbing up and down and numerous abseils, we reached Canzio Bivouac in good time (9 hours). What we didn't expect was there were so many other climbers in the tiny hut! Canzio Bivouac had 8 spaces, and 11 climbers slept in the hut at night on this day. More potentially serious trouble was our gas ran out after making water to take the following day from snow, despite we stopped boiling but was content with just melting. There is no running water at the altitude; gas is crucial to make water, and water is essential at altitude, far more than in the lower ground. 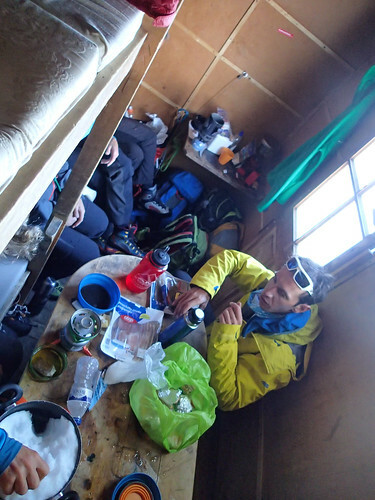 We collected as much snow as possible in a pan at night, and as luck would have it, the hut was so warm, thanks to the combined human heat, all the snow transformed into water by the following morning to get an enough sip for both of us! The fact I had to nibble dry muesli for the breakfast was nothing. 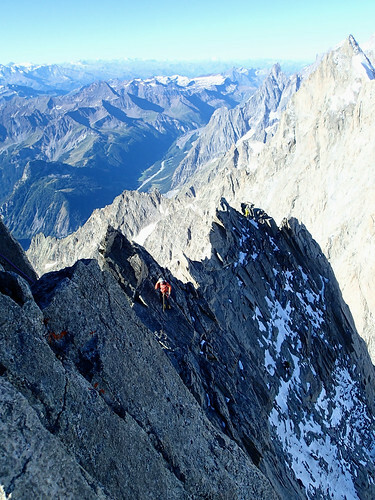 The crux of the entire traverse is the first few pitches from Canzio Bivouac to Pointe Young, the first summit of Grandes Jorasses Massif proper. The route finding is allegedly not straightforward, either. Therefore, we did not leave the hut too early, while some (guided) parties had left at as early as 3 am. We left the hut at 6 am, and were inevitably behind a cue. We managed with big boots, though it would have been much easier with climbing shoes, as the crux pitch being at F5a (roughly HS). After Pointe Young, we eventually overtook 2 parties ahead of us, and set our pace, moving together for the rest of the way, interspersed with a few abseils. The exposure was phenomenal. The situation was unrivalled. The difficulty was sustained, though never desperate. It was the best alpine climbing I have ever done. Finally, we made the main summit Pointe Walker, greeted with the grand view! I was impressed how insignificant Les Drus, which is arguably the most iconic double peak when viewed from Chamonix valley, looked from there. Grandes Jorasses lives up to its name! 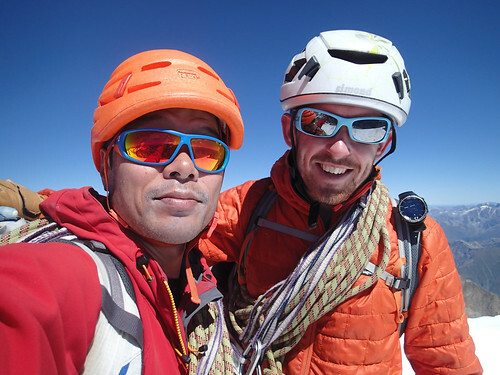 Masa and Richard at Pointe Walker (4208m), the main summit of Grandes Jorasses. It took us 7.5 hours from the hut to the summit, which is not bad considering we had got stuck behind the cue for 8 or so pitches in the morning (guidebook time of 8-10 hours). After another 6.5 hours with a coffee break at Boccalatte hut, as Richard had understandably missed coffee so much after no coffee in the morning(! ), we descended to an Italian road, before hitching back to Chamonix and celebrating our climb with pizzas. 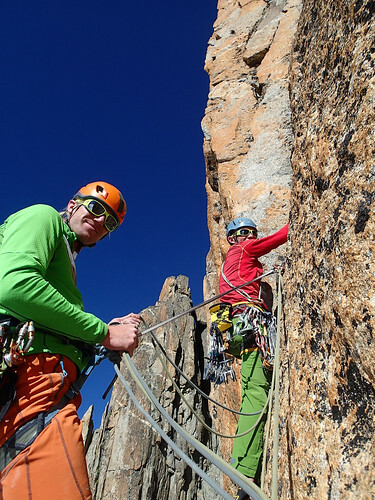 In alpine climbing, there are always many concerns before a climb. In this case, my main concern was a sprained ankle. Rich said in a light tone, before the climb, strap well and it will be fine , which I did, and it was fine. Another concern was a partnership, as we had never climbed together before, but it went well too, to my joy. Among many concerns climbers may have, some of them are realistic, while others are perhaps not so. To get the right balance on it is always an issue. To consider to climb Grandes Jorasses was a little intimidating to me. But I am jolly glad I went for it and made it very well. One of my original dreams in mountaineering is accomplished. Towards Aiguille Verte, shot from the summit of of Grandes Jorasses. 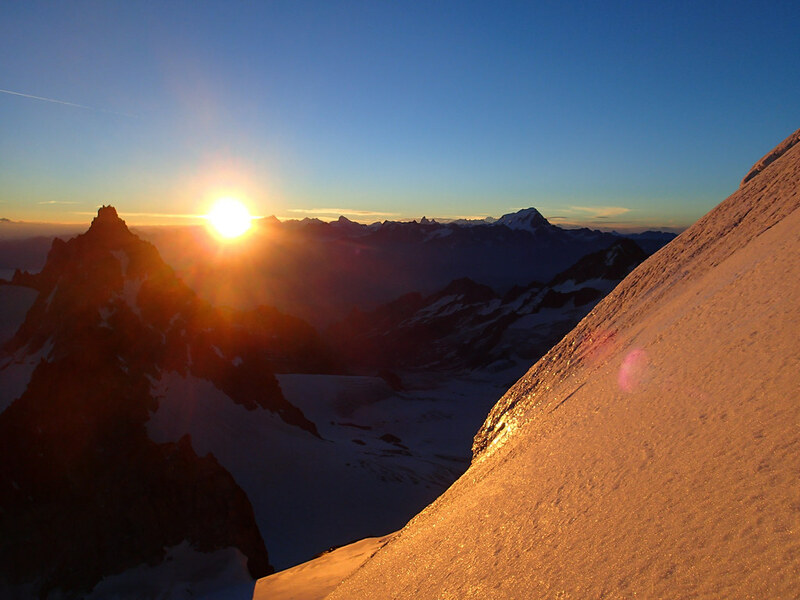 Sunrise from Aiguille du Chardonnet, during our climb of Forbes Arete. All the photos are taken by the author and their license is CC-SA-2.0 (crick the CC mark at the caption of each photo for detail), unless otherwise noted.